It’s been just over two weeks since Coyote Creek overflowed and forced thousands of San Jose residents from their homes, but those who are still living in a shelter are now struggling with a host of sicknesses. Nearly 130 people call the Seven Trees Community Center home, but some of them told NBC Bay Area that they are living amid dangerous and deteriorating conditions. A woman, who asked to remain anonymous, said that she visited a doctor on Friday after contracting pneumonia at the shelter. “He told me the bacteria that is in the air that I’ve been breathing from the floods is how it started,” she said. Her infant nephew also has an infection – and he is not alone. 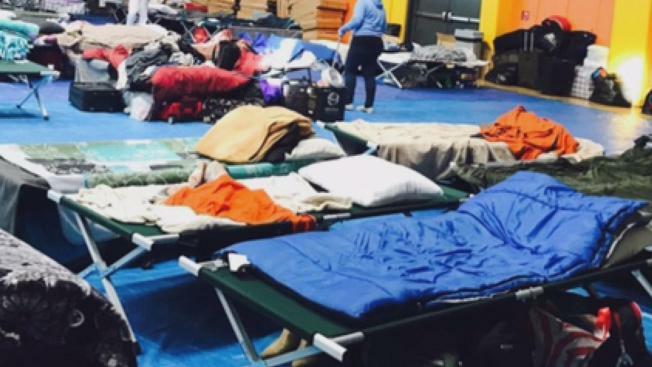 Virtually everyone in the shelter is sick, evacuees told NBC Bay Area. “In the night you can hear them vomiting, hear them coughing … and it’s scary,” the woman said of others who are sharing their living quarters. However, HomeFirst runs homeless shelters across Santa Clara County, including the one in question in San Jose, and CEO Andrea Urton said all residents are being cared for. “Sleeping in a tight space like that, a few people have the cold, maybe the flu, but everyone is being treated appropriately,” she said, noting that medical personnel were at the shelter Friday and no one complained of being sick. To that, Ray Bransom of the San Jose Department of Housing added: "If somebody came to the shelter and said they were impacted by the floods, our partners at the American Red Cross let them in and provided them with the care and aid they needed." The flood victim, however, told NBC Bay Area that she was surprised to find out she’d be sleeping in cots next to 33 homeless people. That came as a shock to some who say they were initially told people would need proof of residence to get into the shelter. The woman said she and her family haven't felt safe at night because of the homeless people, even though there is uniformed security around the clock. She also said that people have been walking in off the street and helping themselves to food and items donated for flood victims. City officials said they offered flood victims motel vouchers, but the woman’s family said the motel rooms smell like cigarette smoke, which made them sicker. Worse still, they say prostitutes hang out next to the motel. So they're back to taking their chances at the shelter, the woman said. Representatives of HomeFirst told NBC Bay Area on Friday evening that all the homeless people will be moved to another shelter — the Boccardo Reception Center — on Saturday. They also said that have made photo badges for evacuees at the Seven Trees shelters to ensure that all the donations benefit those who need the help. Representatives of Catholic Charities of Santa Clara County were at Seven Trees on Friday to begin the process of moving families to temporary and permanent housing, if possible. But everything is on a case-by-case basis and there is no timeline in place.